Why Do People Hate US? Drone training takes place at the 133,000-acre Military Pohakuloa Training Area (PTA) in the center of Hawaii Island and other areas throughout Hawaii! How Do You Take Your Poison? We will all swallow our cup of corporate poison. We can take it from nurse Romney, who will tell us not to whine and play the victim, or we can take it from nurse Obama, who will assure us that this hurts him even more than it hurts us, but one way or another the corporate hemlock will be shoved down our throats. The choice before us is how it will be administered. Corporate power, no matter who is running the ward after January 2013, is poised to carry out U.S. history’s most savage assault against the poor and the working class, not to mention the Earth’s ecosystem. And no one in power, no matter what the bedside manner, has any intention or ability to stop it. If you insist on participating in the cash-drenched charade of a two-party democratic election at least be clear about what you are doing. You are, by playing your assigned role as the Democratic or Republican voter in this political theater, giving legitimacy to a corporate agenda that means your own impoverishment and disempowerment. All the things that stand between us and utter destitution—Medicaid, food stamps, Pell grants, Head Start, Social Security, public education, federal grants-in-aid to America’s states and cities, the Women, Infants, and Children nutrition program (WIC), Temporary Assistance for Needy Families and home-delivered meals for seniors—are about to be shredded by the corporate state. Our corporate oligarchs are harvesting the nation, grabbing as much as they can, as fast as they can, in the inevitable descent. We will be assaulted this January when automatic spending reductions, referred to as “the fiscal cliff,” begin to dismantle and defund some of our most important government programs. Mitt Romney will not stop it. Barack Obama will not stop it. And while Romney has been, courtesy of the magazine Mother Jones, exposed as a shallow hypocrite, Obama is in a class by himself. There is hardly a campaign promise from 2008 that Obama has not broken. This list includes his pledges to support the public option in health care, close Guantanamo, raise the minimum wage, regulate Wall Street, support labor unions in their struggles with employers, reform the Patriot Act, negotiate an equitable peace between the Israelis and the Palestinians, curb our imperial expansion in the Middle East, stop torture, protect reproductive rights, carry out a comprehensive immigration reform, cut the deficit by half, create 5 million new energy jobs and halt home foreclosures. Obama, campaigning in South Carolina in 2007, said that as president he would fight for the right of collective bargaining. “I’d put on a comfortable pair of shoes myself, I’ll … walk on that picket line with you as president of the United States of America,” he said. But when he got his chance to put on those “comfortable pair of shoes” during labor disputes in Madison, Wis., and Chicago he turned his back on working men and women. Obama, while promising to defend Social Security, also says he stands behind the planned cuts outlined by his deficit commission, headed by Morgan Stanley board member Erskine Bowles and former Sen. Alan Simpson, a Wyoming Republican. The Bowles-Simpson plan calls for cutting 0.3 percentage points from the annual cost-of-living adjustment in the Social Security program. The annual reduction would slowly accumulate. After a decade it would mean a 3 percent cut. After two decades it would mean a 6 percent cut. The retirement age would be raised to 69. And those on Social Security who continued to work and made more than $40,000 a year would be penalized with further reductions. Obama’s payroll tax cuts have, at the same time, served to undermine the solvency of Social Security, making it an easier target for the finance corporations that seek to destroy the program and privatize the funds. But that is just the start. Cities and states are frantically staving off collapse. They cannot pay for most pension plans and are borrowing at higher and higher interest rates to keep themselves afloat. The country’s 19,000 municipalities face steadily declining or stagnant property tax revenues, along with spiraling costs. Annual pension payments for state and local plans more than doubled to 15.7 percent of payrolls in 2011 from 6.4 percent a decade ago, according to a study by the Center for Retirement Research at Boston College. And local governments, which made some $50 billion in pension contributions in 2010, face unfunded pension liabilities of $3 trillion and unfunded health benefit liabilities of more than $1 trillion, according to The Nelson A. Rockefeller Institute of Government. State and local government spending fell at a rate of 2.1 percent in the second quarter of this year, according to the Commerce Department. It was the 11th consecutive quarterly reduction in expenditures. And in the past year alone local governments cut 66,000 jobs, mostly those of teachers and other school employees, reported The Wall Street Journal, which accumulated this listof grim statistics. The costs of our most basic needs, from food to education to health care, are at the same time being pushed upward with no control or regulation. Tuition and fees at four-year colleges climbed 300 percent between 1990 and 2011, fueling the college loan crisis that has left graduates, most of them underemployed or unemployed, with more than $1 trillion in debt. Health care costs over the same period have risen 150 percent. Food prices have climbed 10 percent since June, according to the World Bank. There are now 46.7 million U.S. citizens, and one in three children, who depend on food stamps. The U.S. Immigration and Customs Enforcement agency under Obama has, meanwhile, expelled 1.5 million immigrants, a number that dwarfs deportations carried out by his Republican predecessor. And while we are being fleeced, the Treasury Department and Federal Reserve Bank has since 2008 doled out $16 trillion to national and global financial institutions and corporations. Fiscal implosion is only a matter of time. And the corporate state is preparing. Obama’s assault on civil liberties has outpaced that of George W. Bush. 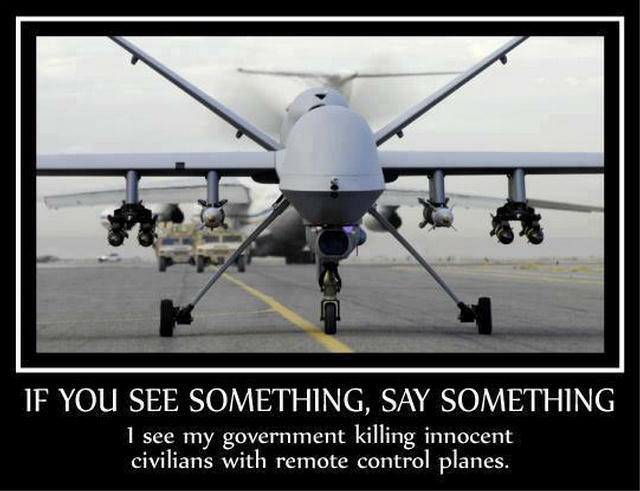 The refusal to restore habeas corpus, the use of the Authorization to Use Military Force Act to justify the assassination of U.S. citizens, the passing of the FISA Amendments Act to monitor and eavesdrop on tens of millions of citizens without a warrant, the employment of the Espionage Act six times to threaten whistle-blowers inside the government with prison time, and the administration’s recent emergency appeal of U.S. District Judge Katherine Forrest’s permanent injunction of Section 1021(b)(2) of the National Defense Authorization Act give you a hint of the shackles the Democrats, as well as the Republicans, intend to place on all those who contemplate dissent. But perhaps the most egregious assault will be carried out by the fossil fuel industry. Obama, who presided over the repudiation of the Kyoto Accords and has done nothing to halt the emission of greenhouse gases, reversed 20 years of federal policy when he permitted the expansion of frackingand offshore drilling. And this acquiescence to big oil and big coal, no doubt useful in bringing in campaign funds, spells disaster for the planet. He has authorized drilling in federally protected lands, along the East Coast, Alaska and four miles off Florida’s Atlantic beaches. Candidate Obama in 2008 stood on the Florida coastline and vowed never to permit drilling there. You get the point. Obama is not in charge. Romney would not be in charge. Politicians are the public face of corporate power. They are corporate employees. Their personal narratives, their promises, their rhetoric and their idiosyncrasies are meaningless. And that, perhaps, is why the cost of the two presidential campaigns is estimated to reach an obscene $2.5 billion. The corporate state does not produce a product that is different. It produces brands that are different. And brands cost a lot of money to sell. You can dismiss those of us who will in protest vote for a third-party candidate and invest our time and energy in acts of civil disobedience. You can pride yourself on being practical. You can swallow the false argument of the lesser of two evils. But ask yourself, once this nightmare starts kicking in, who the real sucker is. A group of about 25 people from Kohala, Hamakua, Hilo and Puna joined together in a peaceful protest of 700 acres of GMO (Monsanto genetically engineered) corn being grown by Big Island dairy at the 30 mile marker on the Hamakua Coast. 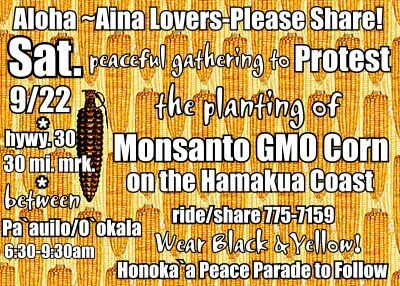 The sign holding along Hwy 19 took place from 6:30-9:30 and included such signs as “Big Island dairy 700 acres of GMO corn”, “Aloha Aina: A call to Action,” and “No GMO!” The event was initiated by Eden Peart of Honoka’a. The Hamkua Ag plan calls for the area to be GMO-Free so next steps will be looking into how to honor that Ag plan. Big island dairy has been bought by a U.S. mainland company. The GMO corn is visible on the mauka side of Hwy 19 at the 30 mile marker. Rats fed a lifetime diet of Monsanto’s genetically engineered corn or exposed to the company’s popular Roundup herbicide developed tumors and suffered severe organ damage, according to a French study released on Wednesday.